Last Saturday, my friend Ciara asked if I would like to go to a workshop with her. It was something called The Desire Map. I like a good workshop, so I said sure, why not! Best reason to get dressed in 2016 so far. It was an introductory class, because the desire map is a program that takes a little while, but I am definitely hooked. Leading this three-hour-workshop-that-turned-into-four, was Kate. You know those people who’s light shines bright, making everything around them glow and sparkle? Well, that’s Kate. Her love and passion for this process were present in each step she guided us through. So many of the words she spoke have been swirling around my head for the past few days. I feel inspired. She also led us through a meditation. To be honest, meditation is not my favourite thing. I’ve never been invested enough to practice, so I’m not very good at it. This meditation, however, was set to music, and it was beautiful. When I picked up my journal to write after it was done, I realized I was smiling. I was happy. Because of meditation! All I had felt before was grumpiness. I’d heard of Danielle Laporte before, because a few years ago, I stumbled onto this quote and I thought Can it really be that simple? Turns out, she created The Desire Map. It’s about generating your core desired feelings, and pretty much finding out what makes you feel good. Sounds simple, right? I feel excited about this. This is something I want more of. The excitment, the happiness, the joy. I’m not really one of those “new year, new me” people. I like to think I’m pretty awesome, so I’ll just keep on doing that. However, I do like lists, and I like looking back at the year I just left behind. 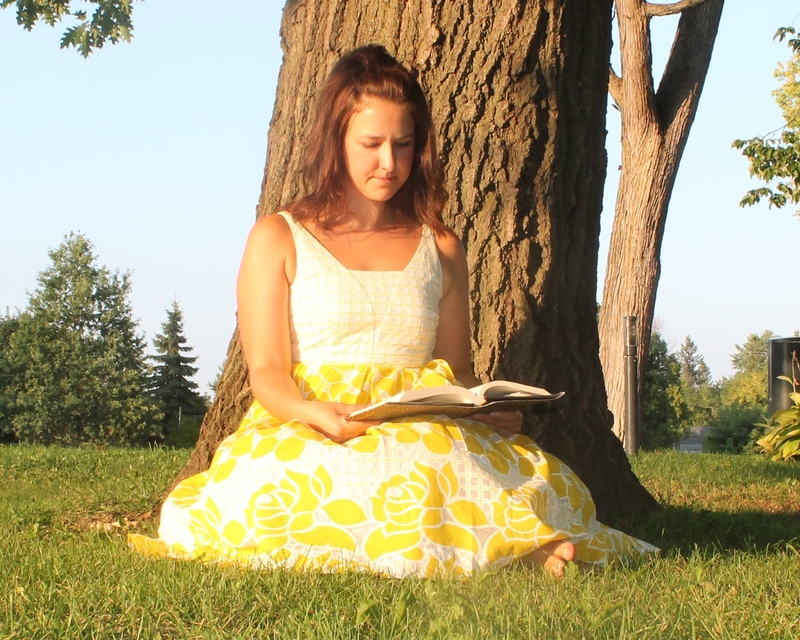 When I read Julie‘s blog post about 50 happy things, I decided I would do it too. You should read it, she’s hilarious! Apparently, you’re supposed to list 50 things in 10 minutes, but I don’t like being told what to do, so I’m going to take as long as I want. This is not in any particular order. Watching my sister be a mom. Going on a road trip with my best friend. Driving to a monastary for cheese, while on this road trip. Being creeped out because it was in the middle of nowhere. Running away from a nun (or other religious person). I don’t think she saw us. Falling down because of Crossfit. Going to Costa Rica for the third time. Hiking up a volcano in flip-flops because the airline lost my backpack. Cooking Thanksgiving dinner with my cousins. Going to San Diego with one of my best friends. Going to Paint Nite twice. Road trip with my family. Asking the flight attendant for help listing all 50 states, and having her sing us a song she learned when she was little. Dressing up as a cavewoman at school for a unit on the paleolithic era. Getting a Kate Spade handbag. Reading “The life-changing magic of tidying-up”. Going all Konmari on my clothes. Watching my parents become grandparents. Going to the San Diego zoo. Designing my new house on Pinterest. Laughing with my best friend. We are hilarious. Winning 20$ on a lottery ticket. 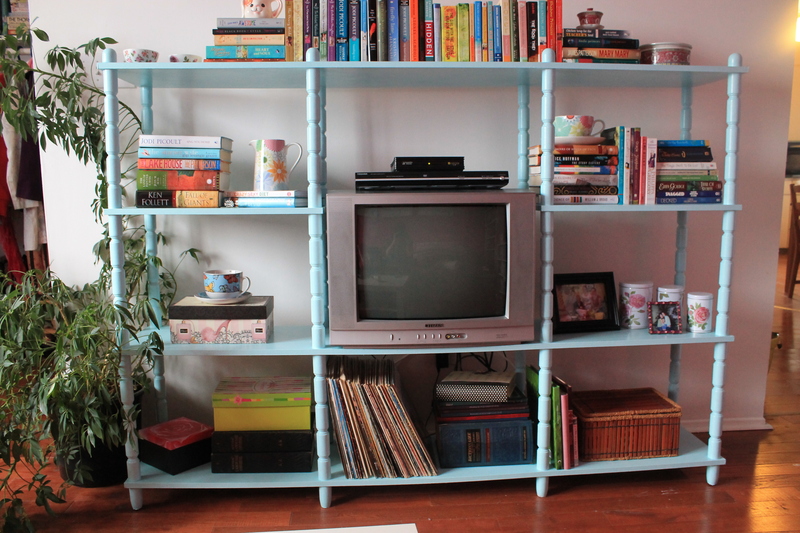 Arranging my bookshelf by colour. Making apple pie with my mom, my sister and my niece. Wow, 50 is a lot! However, I could keep going. 2015 was a difficult year, as I lost a family member I cared for very much, but there was a lot of good in there too! Here’s to making 2016 even more fabulous! I don’t believe in guilty pleasures. If I like something, I like it. No need to feel guilty about it. Everyone’s always going on and on about how dark chocolate is their guilty pleasure. You know what I like? Milk chocolate. The kind with lots of sugar and fat and deliciousness. And I don’t feel bad about it either. We all like something that would make other people think we’re crazy. You love hiking in the wilderness for days, with snakes and bugs and being smelly? Good for you! I don’t. You enjoy wheatgrass? Superb! These are some of the things I like. They might make me seem weird to you, or kind of crazy, and that’s ok. But none of them are guilty pleasures, because that’s the worst oxymoron I’ve ever heard. I like airports. If I’m in an airport, it means I’m going on an adventure. My tea costs 7$ and my carry-on bag gets heavier and heavier, but I’m off to see the wizard! Or, the world, anyways. Maybe I’m on my way home, which always feels nice too. No matter how many books I have with me, I will almost always buy one in the airport bookstore. I love bookstores in general, but one in an airport is like an oasis. All those stressed-out, rushed travelers could benefit from a few minutes surrounded by books. There are some books I’ve read so often, I can open them at any random page and just go from there. I used to think everybody did this. Apparently not. Oh well, you’re missing out, you know. If you loved it the first time, it only gets better. The characters become real, and their world does too. I’ve mentioned this one before. I like November because it’s my birthday month, but also because no one else seems to like it, and that’s sometimes reason enough. 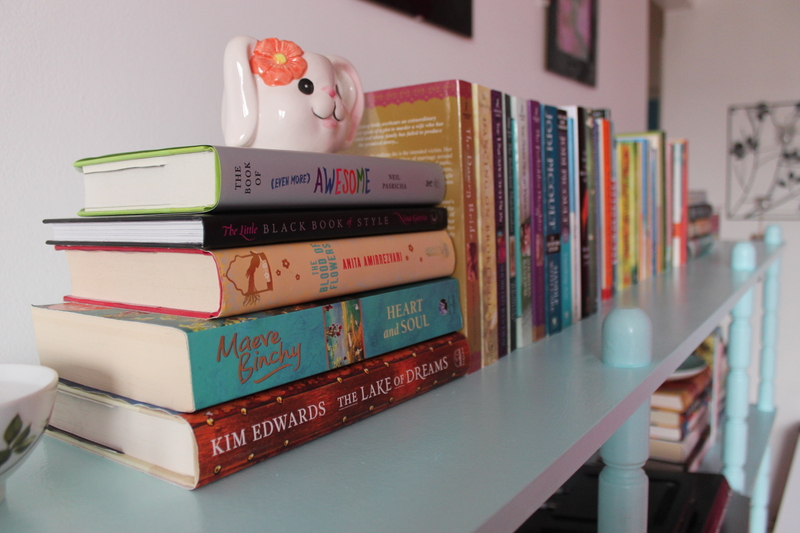 I like rainy days where I am inside, looking out, drinking tea, reading books and writing. Grey is a good colour, because it makes others colours stand out. Walk around in a pink raincoat and yellow umbrella, and watch people smile. I actually don’t understand why people don’t enjoy wearing dresses. They say things like “They’re so uncomfortable”, “I don’t like tights” and “You look so fancy”. If you don’t like dresses, that’s ok. But I love them. They make me feel amazing, and to me, they are 12 million times more comfortable than jeans. I really don’t like insults disguised as compliments (I don’t imagine anyone does). I often get told I’m “fancy”. It’s said in a joking manner, but really, it’s not. I don’t tell you you look so “comfortable” in your jeans. Live and let live people. I also love a lot of things that could never be considered a guilty pleasure, even by people who believe in those, like my new niece, drinking copious amounts of tea, reading, traveling, venting about life to my best friend, writing, dreaming and planning my dream library. This post turned out differently than I expected. 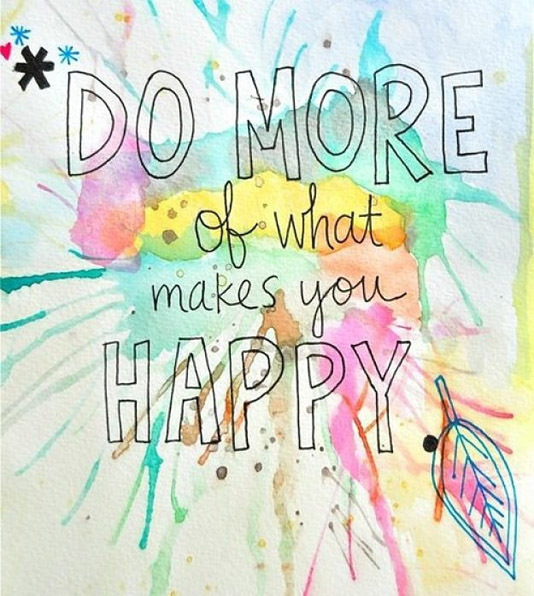 I think it comes down to enjoying what makes you happy, and not judging other people for what they like. I really don’t get the whole vegan thing, but if that’s what makes you happy, then what does my opinion matter? As a rule, we are gentler with other people than we are with ourselves. So maybe we should all take it easy on ourselves. Now, if you’ll excuse me, I’m off to drink tea and eat chocolate in my new dress, while simultaneously re-reading a favourite book and planning my next trip, where I will visit 5 different airports. I haven’t been here in a while. I’ve been busy. Busy in a good way, busy doing amazing things, going on adventures and meeting fascinating people. Not the dreary “I’m so busy with my lists and my job and my schedules and deadlines and things I don’t actually want to do” kind of busy. Happy busy. As I write this, I feel as though I’m brushing down cobwebs and shaking off the dust. I’m settling in, remembering why I love it so much here. I’m getting comfortable, as though I’m sitting in a pile of pillows, wrapped in a blanket with a cup of tea on a rainy day. My, how I do love it here. It does feel a little different, to be honest. Is this space different, or am I? Maybe it’s a combination of both. I’ve had a summer of extreme awesomeness. There are no words to express how truly blessed I feel to live this life. I’ve seen, felt, lived, dreamed, laughed, traveled, sang, cried, jumped, swam, received and given. This is me being comfortable. I call it “Alice in Wonderland before she falls through the rabbit hole.” Adventures are about to happen, but in this moment, I am comfortable. Actually, if I remember correctly, Alice was bored to death before she ended up in Wonderland, so mayby this is not a good analogy after all. 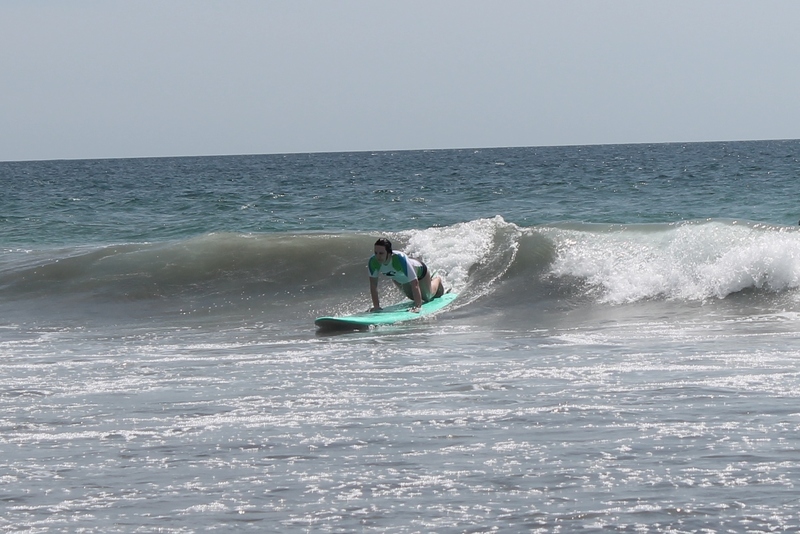 Two weeks ago today, I was surfing in Costa Rica. 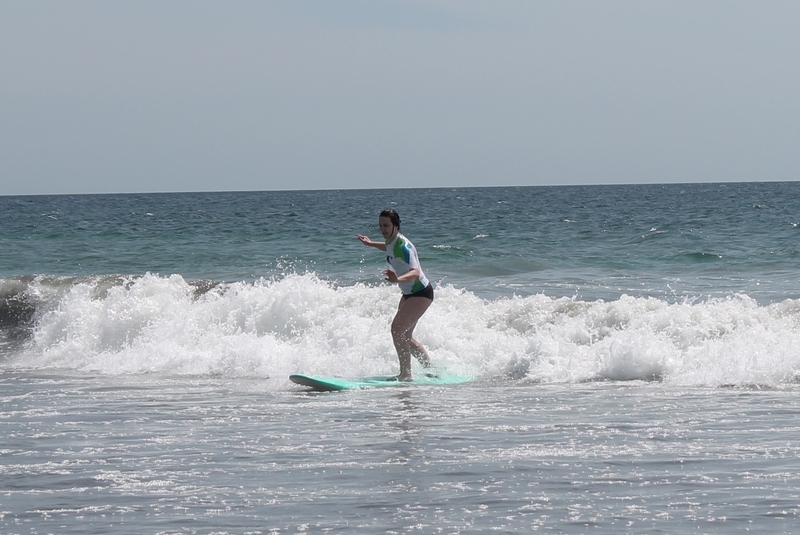 In the weeks leading up to my trip, I told anyone who would listen that I was going to try surfing. 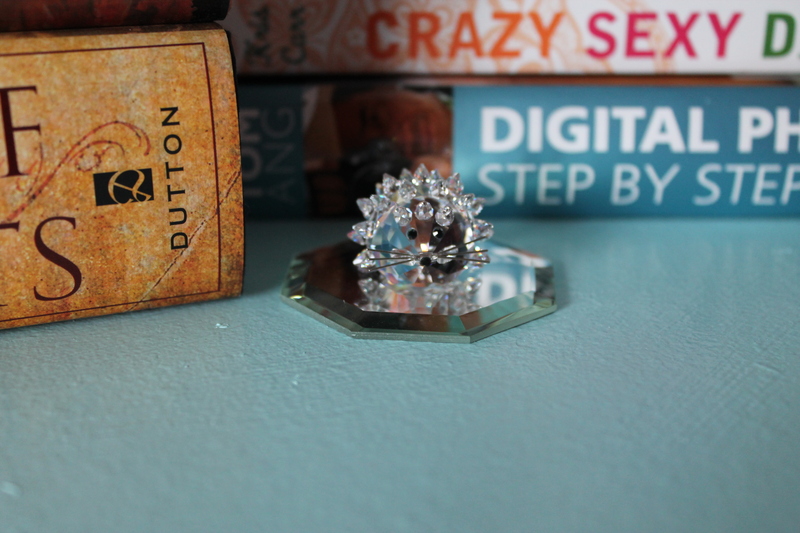 I was very excited about it, even though I didn’t expect to be very successful. Secretly, though, I kind of thought I was all talk. I half-expected to chicken out once I got there. 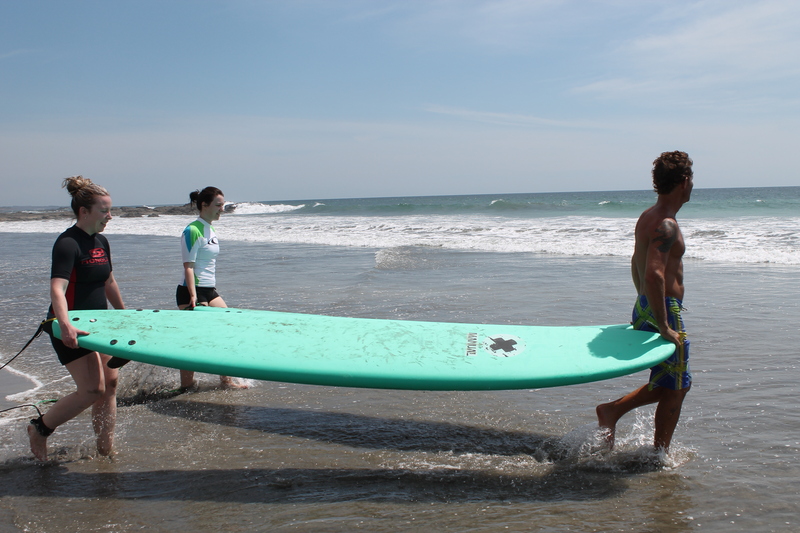 My first full day at Peace Retreat, I asked if anyone would try surfing with me. Another yogi from Ottawa, Mélissa, said she would. We made plans to go the next day. We had a lesson set up and there was no backing out! On the morning of the lesson, I was a little nervous, but I was also busy getting a bikini custom made, so I didn’t think about it much. Once we got to the beach however, I started to have second thoughts. The waves were huge. I’m not a strong swimmer. Also, sharks. 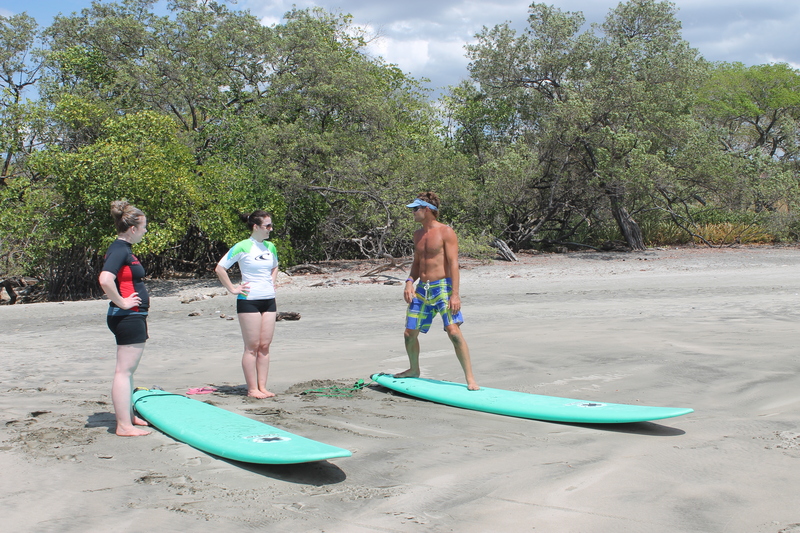 We met up with our surfing instructor, Forest, who was waiting for us on the beach. We practiced laying on the board, paddling and jumping up, feet apart. 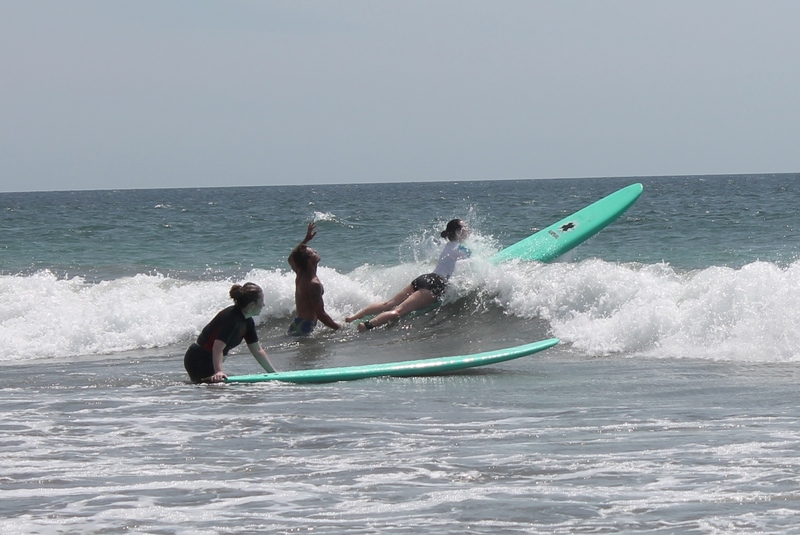 I felt clumsy on the sand, so needless to say, wasn’t super confident I would get up on my board in the water. Walking towards the water, I was still apprehensive, but I was getting more and more excited. Heading straight into the waves, I realized I was afraid I’d be scared, I wasn’t actually scared. After that, I started to have much more fun! I face planted into the ocean several times. Salt water tastes like pretzels. 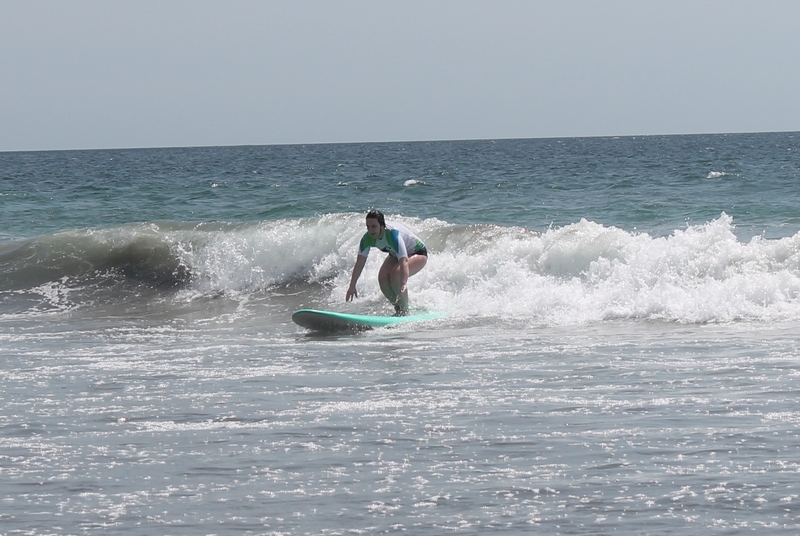 Then, after several tumbles off my board into the waves, something exciting happened. I started to get a feeling. 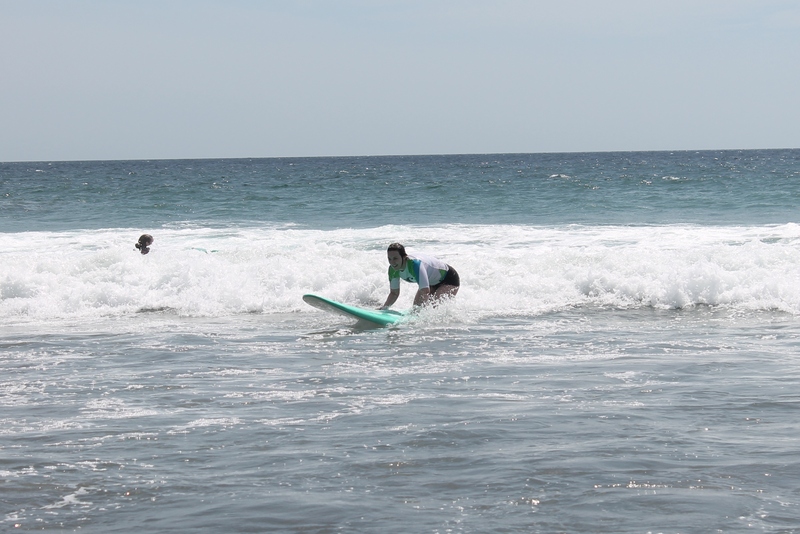 After I started paddling and the wave had me in it’s hold, I would feel like the moment was right. It was time to get up. And I did. More than once! 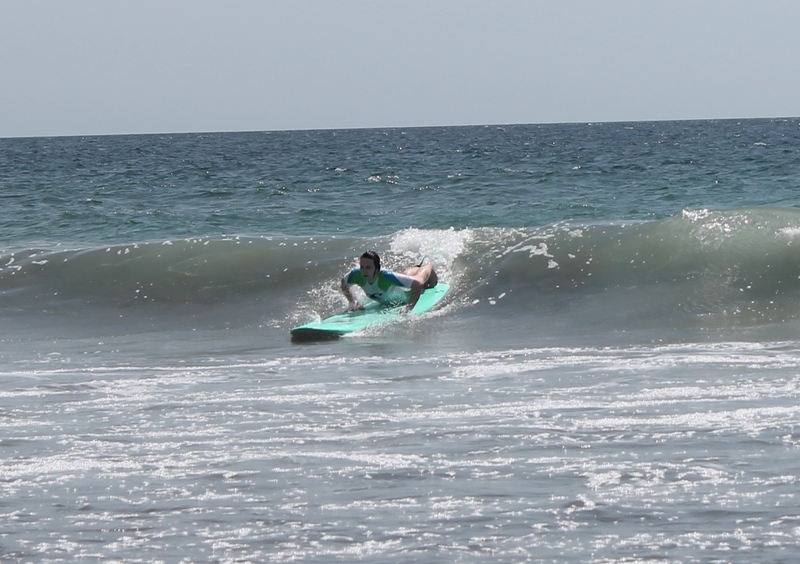 Sure, my board was huge and there was no controlling where it was going, but I was surfing. 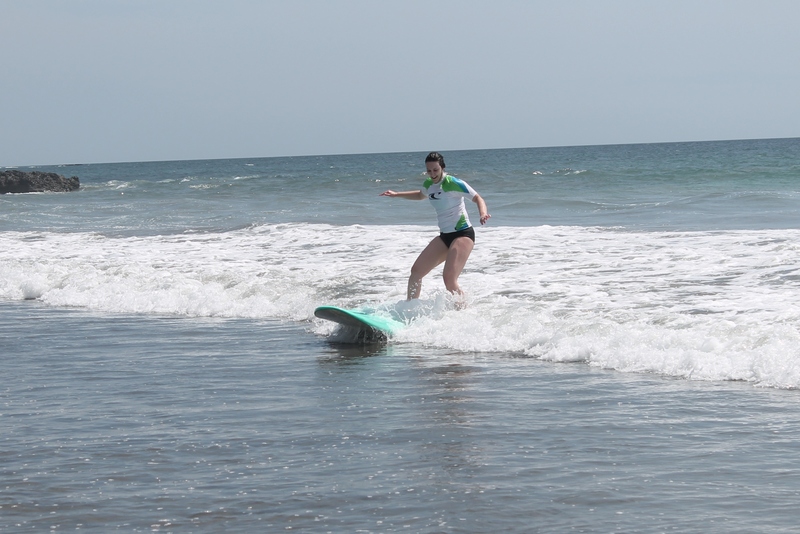 Actually, for real, surfing! It was such a rush! I couldn’t believe I actually did it! Our lesson was for two hours, but after an hour and a half, I was too pooped to keep going. It was hard paddling over the waves. It used a lot of upper body strength that I don’t actually have! Mélissa lasted a little longer than me, but when we were done, we walked back to the retreat very, very slowly. 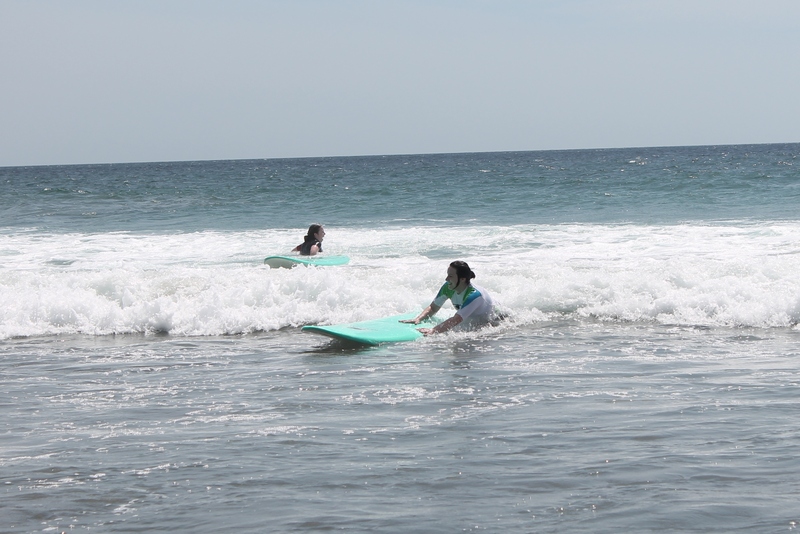 We were covered in sand, I had a huge bruise forming on the back of my leg from rolling around with my board in two inches of water and falling on the fin, our legs and arms were like jello and we had swallowed a gallon of salt water between us. It was the best feeling in the world. You know that feeling, when everything is exactly as it’s supposed to be and you’re exactly where you should be? 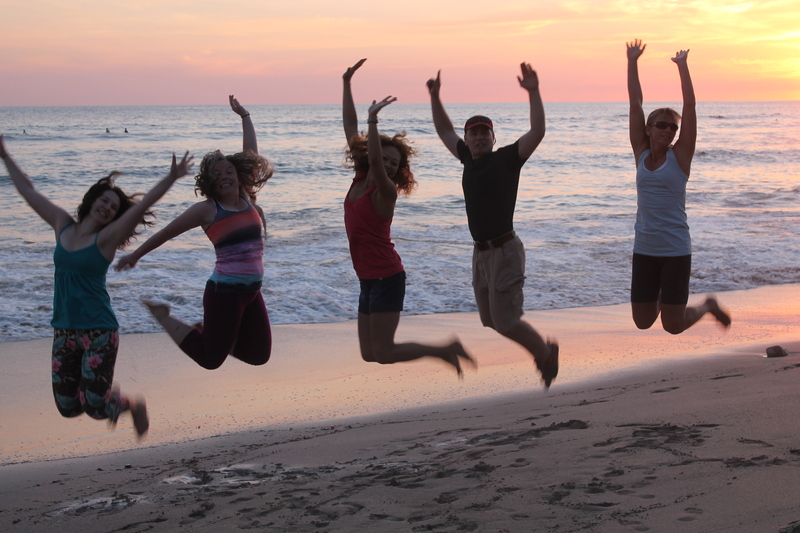 It doesn’t come around very often, but last week, while I was in Costa Rica, I felt it. After only two days, I knew I belonged there. It just felt right. I’m not ready to give up my whole life and move there, just yet, but I am already planning my next trip. A girl can easily get hooked on the feeling of knowing she is where she is meant to be. I can no more cover my whole trip, even though it was only a week, in one post, than I could count the books I’ve read. It’s impossible, there’s too much magic to squeeze in to one little post. I’m not even sure I can find the words to express the wonder, the joy, the excitement that this adventure brought me. But I will try. 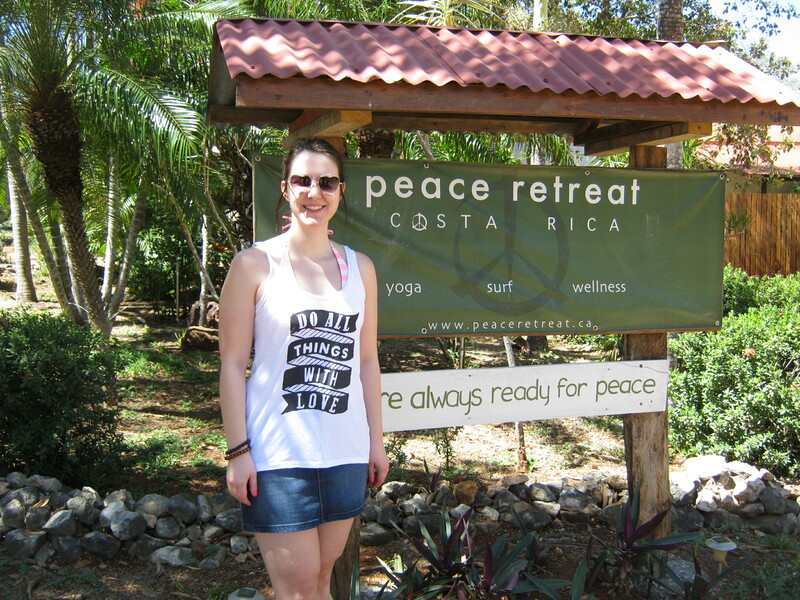 I stayed at a place called Peace Retreat Costa Rica. 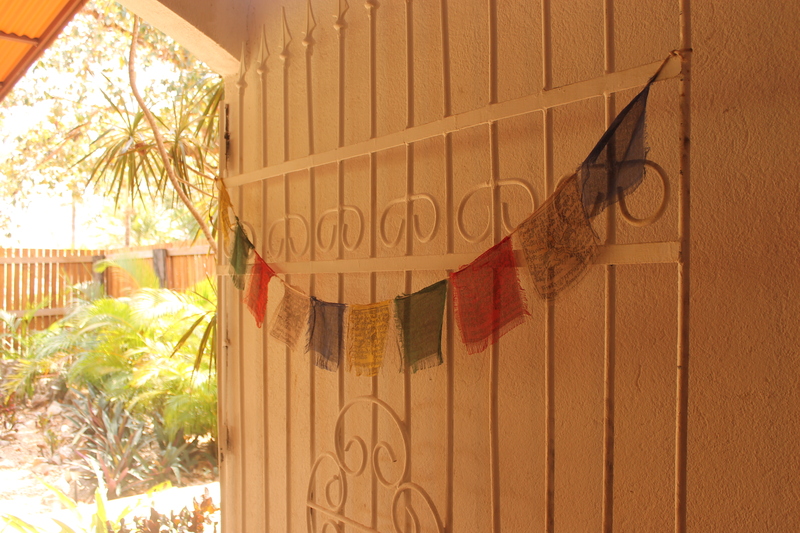 People say Disneyland is the happiest place on earth, but I’m guessing they haven’t been to Peace Retreat yet. 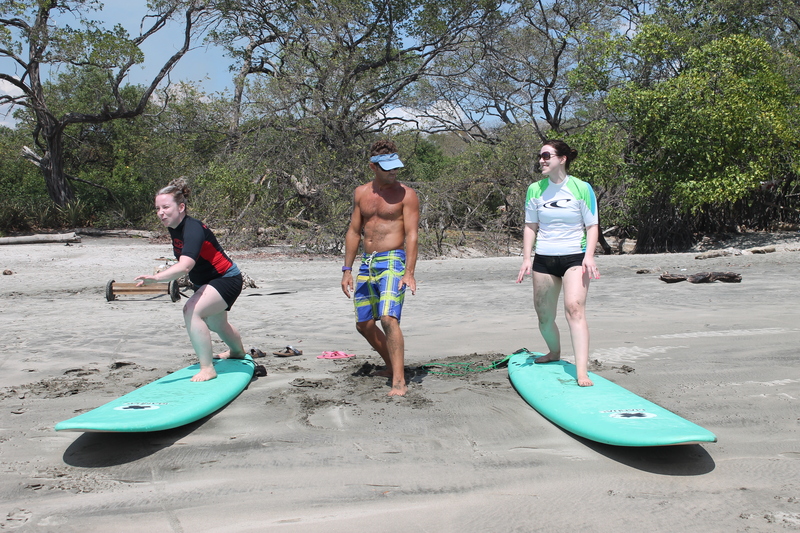 It’s owned and run by Hali and Kevin, two Canadians who moved their life and family down to this happy, beautiful, peaceful corner of Costa Rica. The place is amazing, but it’s their light and love that make it shine. 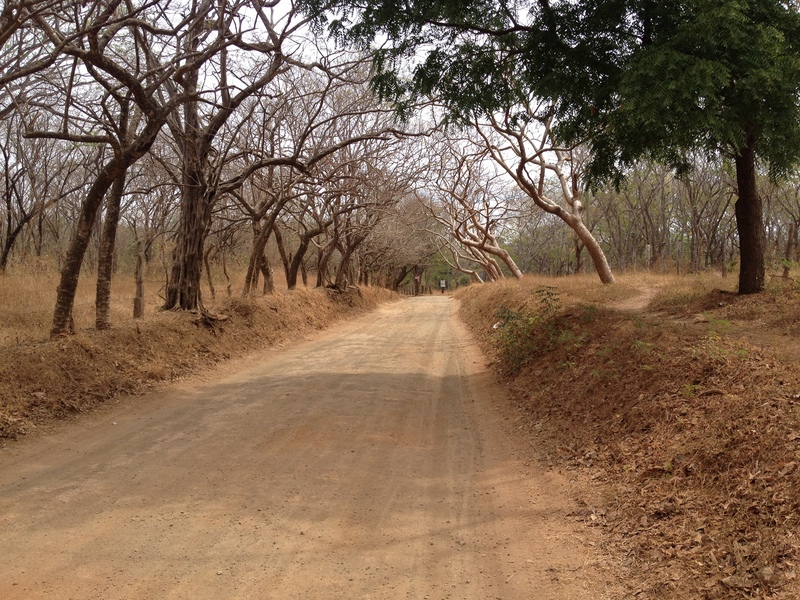 Peace Retreat is located in the village of Los Pargos, which, I learned from a Tico, is slang for lazy people. I didn’t meet anyone I would call lazy, but the slow, easygoing way of life was definitely appealing. 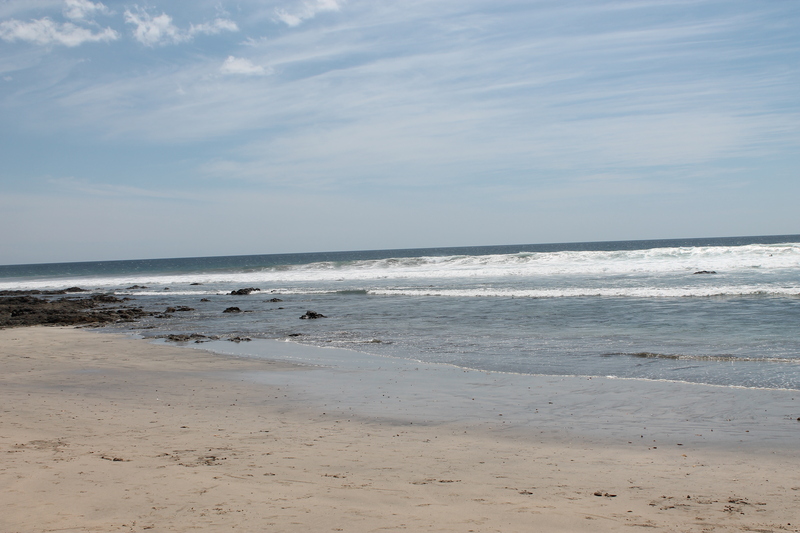 There’s a beach, called Playa Negra, and it draws surfers to it, like bookstores lure me in, like a mermaid calling to the sailors. The village is pretty remote, so it’s not a big tourist attraction. I loved that, even though, technically, I was a tourist. I say technically, because in my heart, I knew I belonged there, and when you belong, you’re not a tourist, are you? There are dirt roads and people regularly stop and ask you if you need a ride. No one wears shoes. Everyone smiles. No one says “I have a deadline” or “I’d love to, but I have to do all this work I brought home”. I’m not saying people’s lives there are perfect, because I’m sure they’re not. We all have our issues, but to an outsider, it all looked pretty amazing. 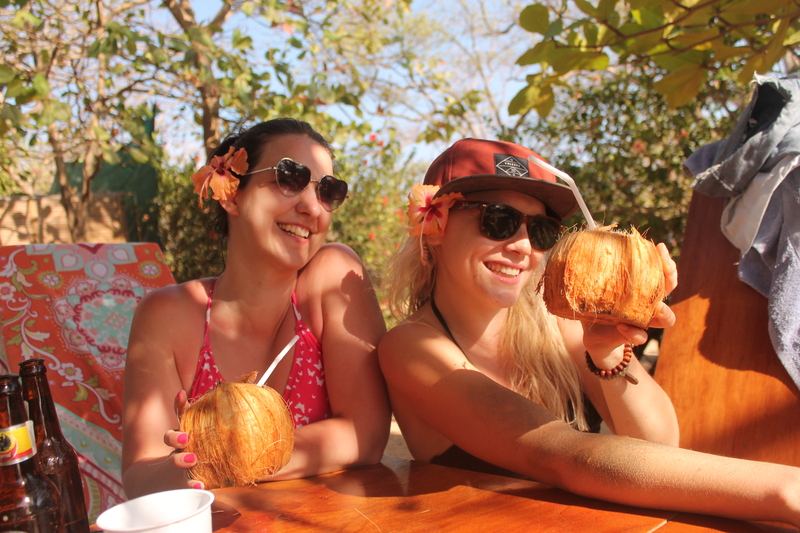 I did yoga, learned how to surf and picked a lemon from a tree. I saw lizards, monkeys and I almost saw a crocodile. (I was happy I didn’t!) I took a stand up paddleboard tour through the mangroves, heard the monkeys every morning before the sun came up and got myself a custom made bikini (pink, of course). 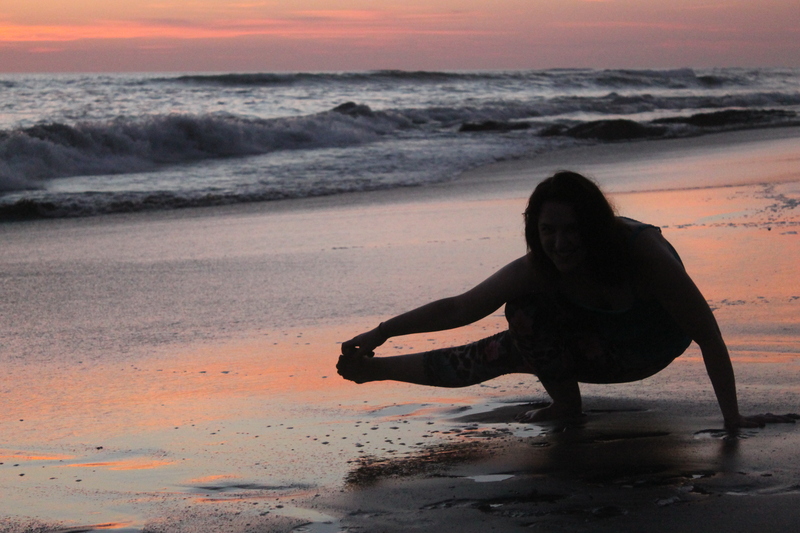 I went to Tamarindo, tried to do a handstand on the beach and leapt into the air every time someone said “Jump shot!”. Pura Vida means pure life. Life at it’s purest form should be, in my opinion, joy. And that’s what I found in Costa Rica. Joy. Bliss. Happiness. 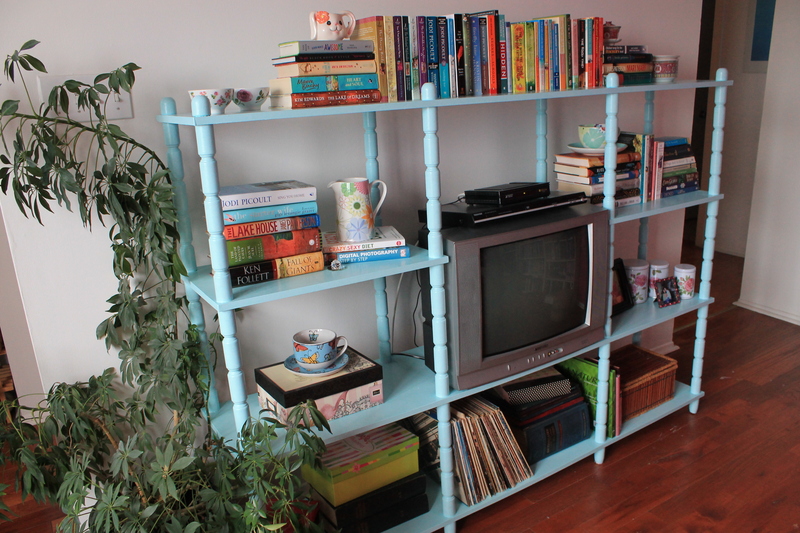 For as long as I can remember, this bookshelf has been in my life. When I was little, it was in our living room. 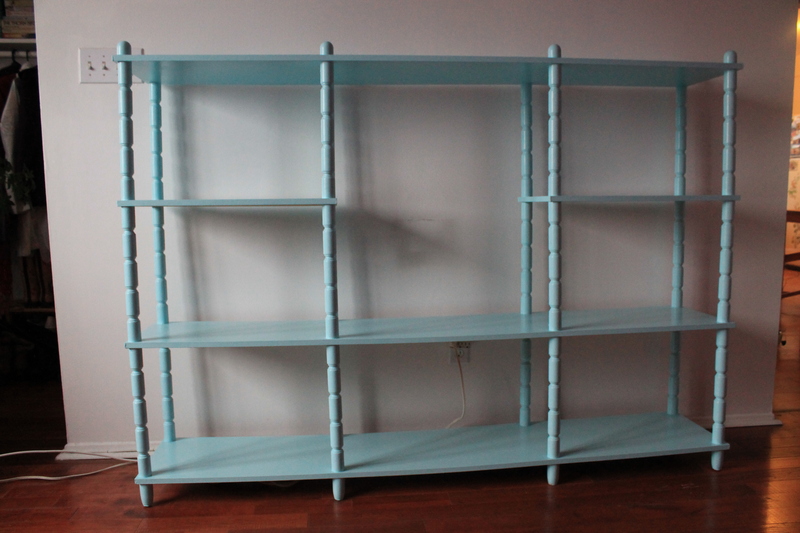 When I was a teen, it was used for storage in the basement. Now, it’s living with me. I’ve always liked the look and shape of it. However, it was looking dated and old. I decided to give it a lift to make it vintage and awesome instead. Along the way, I discovered a love for painting furniture. Like this piece. 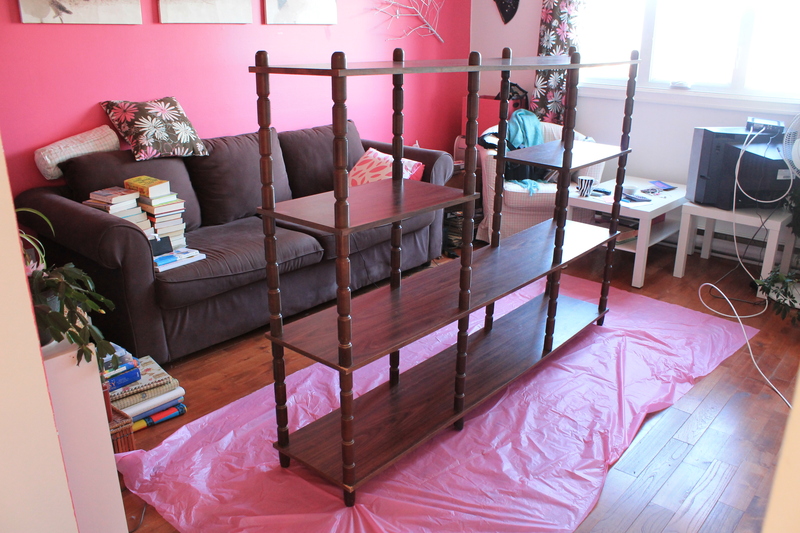 I have plans for you, night table, dresser and weird old cabinet by the door. You’re going to look amazing. 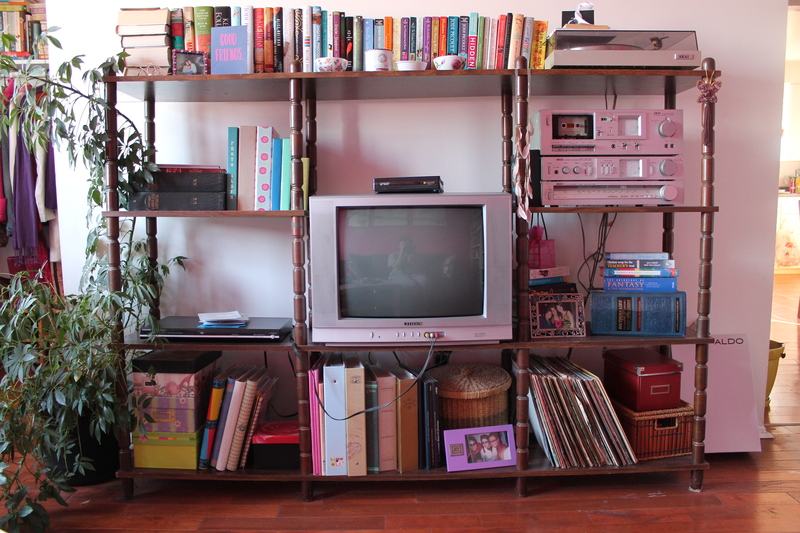 But back to the bookshelves. This is before. It had a lot of stuff on it. Since I decided on this makeover in November, I had to do it indoors. The living room was going to have to do. 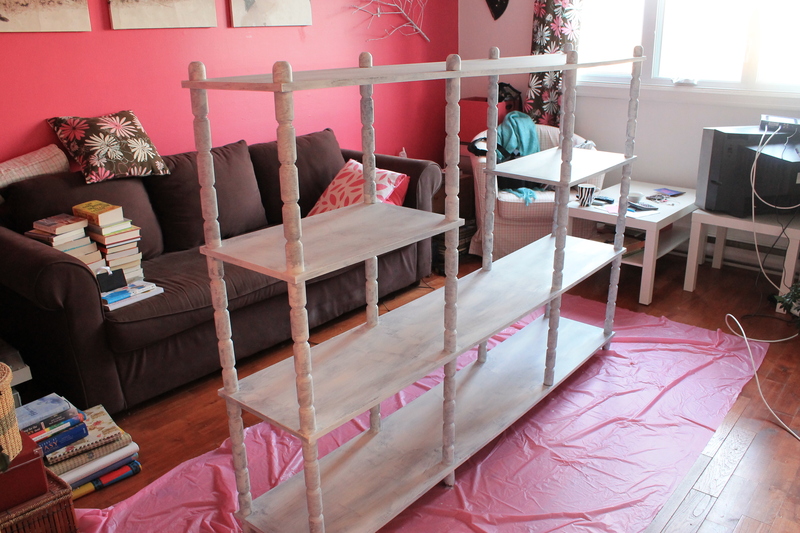 I primed it with an oil-based primer, no need to sand anything. 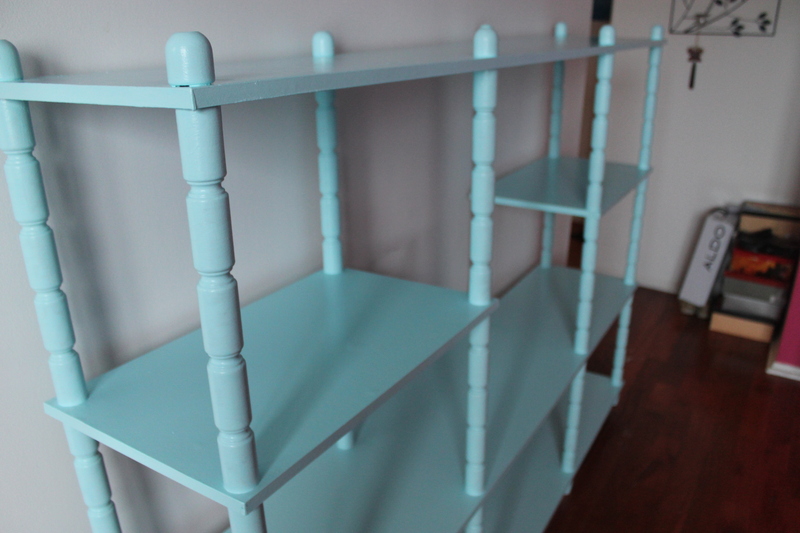 I added two coast of pretty blue latex paint and voilà! 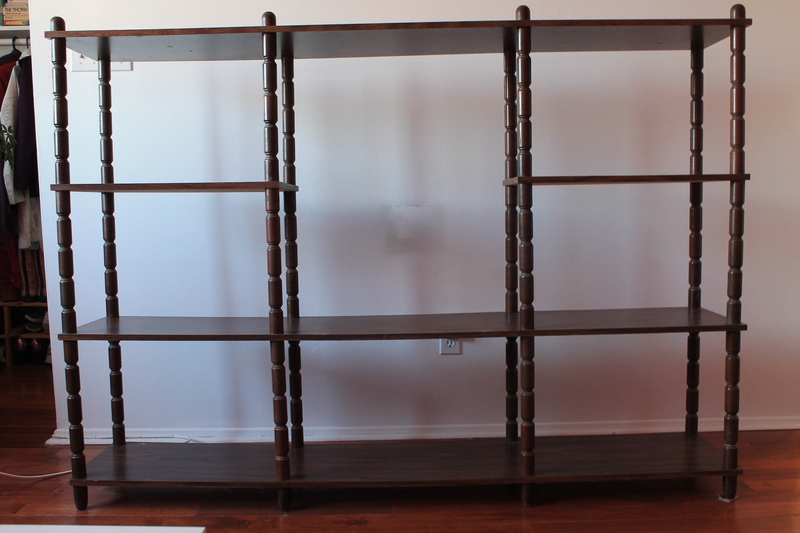 New shelves! I love how fresh and airy it looks now. It feels like a little bit of summer in my living room all the time. Since it’s February, that’s a great feeling!